American earth ionosphere satellite. Explorer 20. Ionospheric research. Research satellite operated by NASA, USA. Launched 1964. AKA: Ionosphere Explorer. Status: Operational 1964. First Launch: 1964-08-25. Last Launch: 1964-08-25. Number: 1 . Gross mass: 44 kg (97 lb). Explorer 20 was designed to measure electron distribution, ion density and temperature, and to estimate cosmic noise levels between 2 and 7 MHz. The satellite was a small ionospheric observatory instrumented with a six-frequency ionospheric sounder and an ion probe. A cosmic noise experiment used the noise signal from the sounder receivers. The satellite consisted of a short cylinder terminated on either end by truncated cones. The ion probe, mounted on a short boom, extended from the upper cone. The six sounding antennas (3 dipoles) extended from the satellite equator. One pair of 18.28 m antennas formed the dipole used for the low frequencies, and the other two dipoles consisted of four 9.14 m antennas. The satellite was spin stabilized at 1.53 rpm just after antenna extension, with the spin axis initially very close to the orbit plane. At the end of 1 year, the spin had slowed to 0.45 rpm. Since there was no tape recorder, data were received only in the vicinity of telemetry stations. Telemetry stations were located to provide primary data coverage near 80 deg W plus areas near Hawaii, Singapore, the United Kingdom, Australia, and Africa. Data were recorded for periods of 1/2 h to over 4 h per day depending upon available power. Even though there were problems with telemetry and interference, the experiments operated satisfactorily for about 16 months. A large spacecraft plasma sheath prevented the ion probe data from being useful in spite of attempts to compensate. 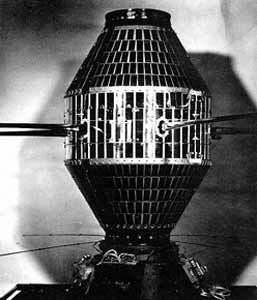 For this spacecraft, the 1-yr automatic satellite turnoff was disconnected just prior to launch. The satellite responses to command signals were not dependable after December 20, 1965, and the satellite transmitter, which was often spuriously turned on, did not respond to a turnoff command. Family: Earth, Ionosphere sat, Medium earth orbit. Country: USA. Launch Vehicles: Scout, Scout X-4. Projects: Explorer. Launch Sites: Vandenberg, Vandenberg SLC5. Agency: NASA. Bibliography: 2, 279, 6, 11207, 12641.